It was dry when I got out of the hotel this morning, that surprised me, the sight of the clouds on the horizon though did not. The weather forecast was right and just 17 miles into the ride it started to rain. It was not bad to start with but by the time I got to Thame it was really torrential. 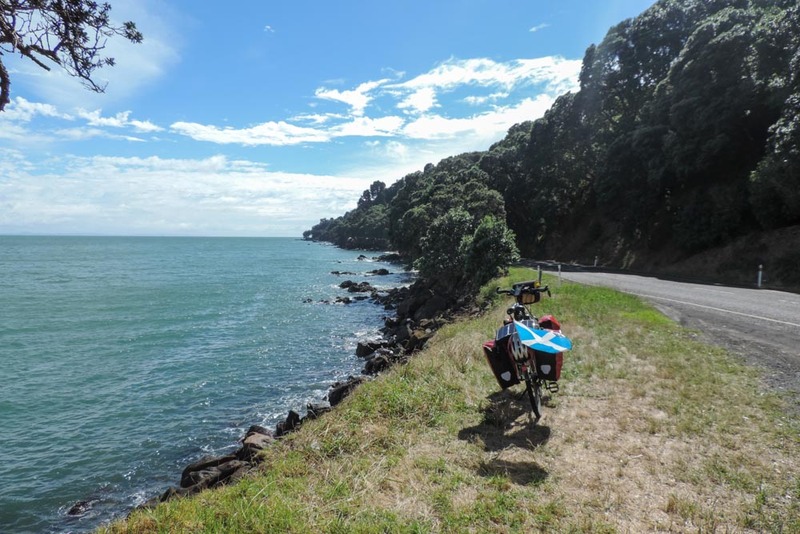 The second part of the Hauraki Trail was ok, in keeping with what you’d expect from a trainline trail it was straight and flat and the only things that were there to break the monotony were the occasional cattle grids and some 20 bridges of various sizes. 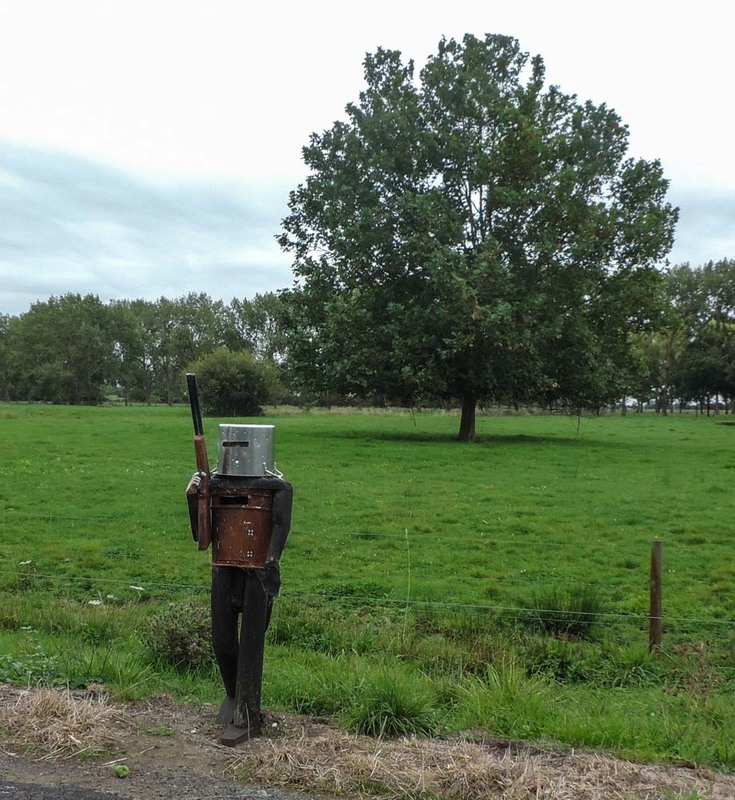 In addition I saw the coolest postbox I’ve ever seen. With some interesting postbox art. After 90 minutes of farm animals along the trail, wet from tip to toe, I got to Thame. It was raining so heavily by now that I had no option but to stop for breakfast. The bakery caffe was just at th entrance of the town and it looked like it had been put there just for me. I took my time as I knew I was in good time and I would have got to the campsite in the very early afternoon. Looking out of the door though I was not completely sure if I was going to cycle or swim there. After a good 30 minutes it looked like the rain had stopped and I decided to make a move. I cycled some 5 miles before the rain started again, and this time it was really strong. 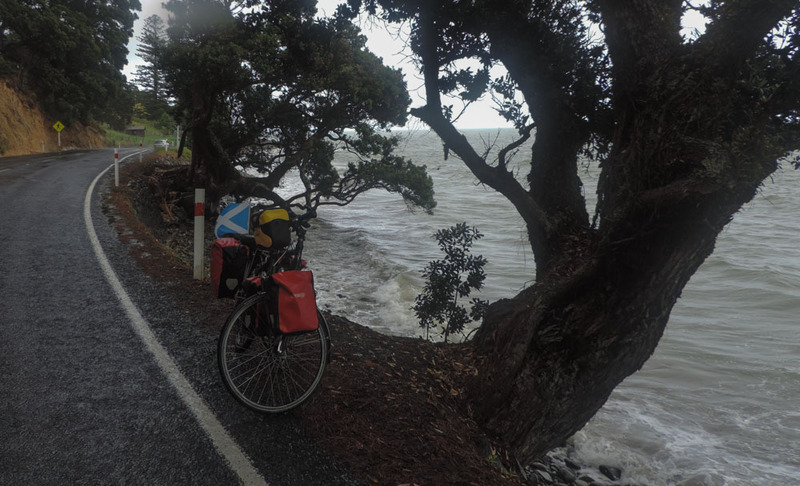 The fact that the road was winding around the coast meant that there were points when the rain was being shot horizontally into my face by the wind. It actually was painful. Not a bit of me was dry. Luckily it did not last very long, another 5 miles and the first bits of blue sky were appearing at the horizon. It was some relief, but the non waterproof shoes were by now completely wet, but the good news was that the waterproof legs were already dry. And the road is really great. As the rain disappeared it become more fun to look at the scenery and the road proved to be really great. 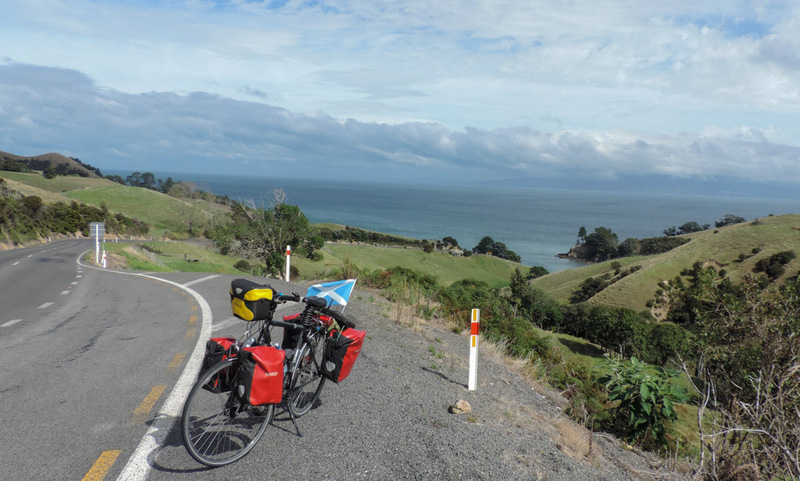 The carriageways were not tht wide but they were right on the edge of the sea with gentle inclinations that made the cycling not boring but not taxing either. I stopped at a rest point where I took my top off and spread stuff to try to get them dry. I woman that was walking by stopped and started chatting with me and I ended up giving her my entire life history. She was very nice about it and sorry that I had already gone through Touranga otherwise there would have been a bed for me at their place. Sometime I feel I am a mix between Forest Gump and the ancient mariner perpetually cycling around while telling my tale to all the people I meet. The scenery continued being very nice and I kept going till mile 40 before there was any hint of serious ascent. In the meantime most of my stuff was now dry apart from the damn shoes. I was thinking to get GoreTex ones some time ago but I am now glad I did not as I might get my clips back on the bike and therefore I will need bike shoes instead. I guess if worse comes to worse I will cycle in my flip flops for a day. Now the weather is much better. When the hill came it was most definitely steep. The good thing though was that the views from the top were great and on the othe side of the hill I wore the goPro on the helmet and hopefully got some good filming of the descent. And the hills have started. The first hill out of the way there was a little respite before the second and last one. 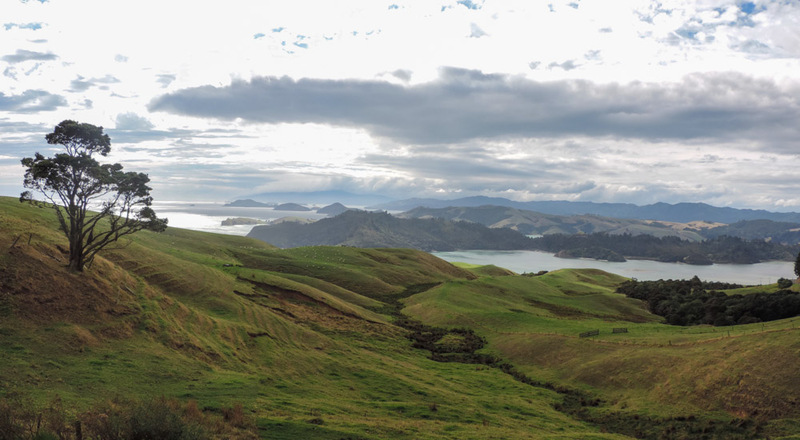 This one was lower but steeper and offered at the top the mother of all views over Coromandel and its bay. The other unexpected surprise on the bottom of the hill was the Coromandel Oyster Company. Having missed out twice on oysters, first in Bluff, by not going, second in Moeraki by them being finished, I was not going to get this opportunity slip. 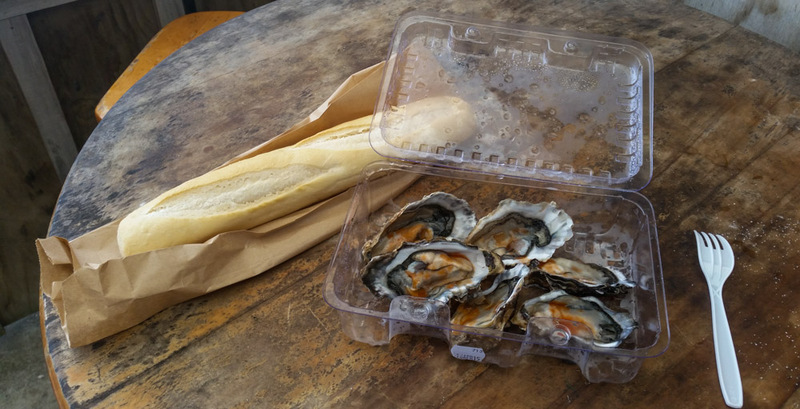 I got half a dozen, sprinkled a drop of tabasco in each and had a rather sublime lunch of bread and oysters. The oyster outfit was only three miles from Coromandel town and it took me no time to get to the YHA hostel and campsite. The place is super and the grass is super bouncy so I’ll be very comfortable tonight. 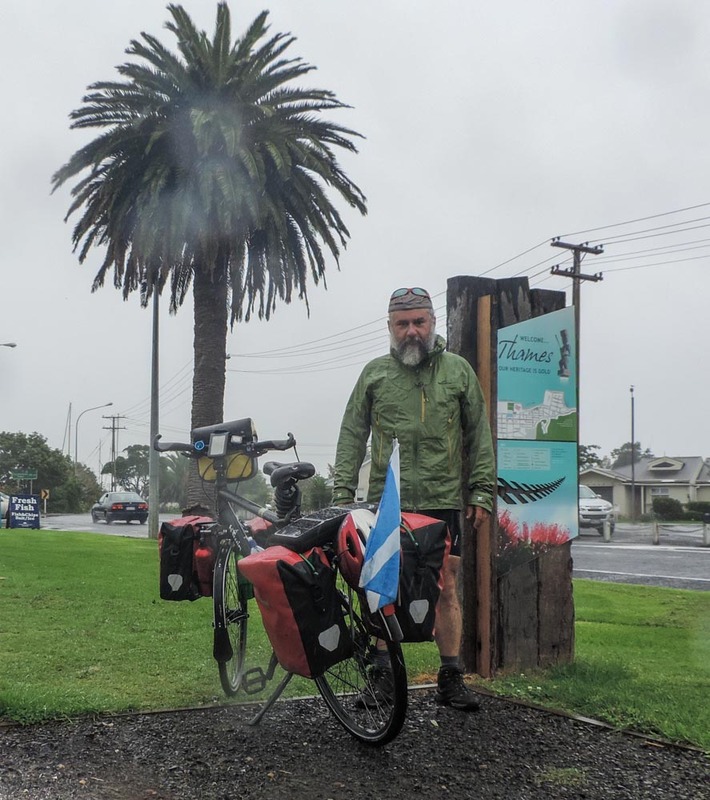 I also met Patrik from Idaho who has just done the South island section of the Te Araroa hiking trail and is now cycling the north island, and Grahame from Alberta who started cycling at Bluff and is tomorrow taking the ferry to Auckland to go and cycle Northland to Cape Reinga. We sat in the communal lounge and chatted a bit about all the trials and rewards of cycle and walk touring, great to get the view of people from different places in the world on things. The real funny thing is that Patrick actually met and walked for a week with Jörg, you remember the guy I met in Invercargill? The world is a small place, New Zealand is even smaller. I am currently exiled into the comunal lounge as the rain is back on, I run out to rescue the shoes and in the process got pretty wet but I did not manage to do any saving and they are back in the state they were when I got into the camp. Will review in the morning what to do with them. Buona notte caro Alex. Settimana assai dura.